We’ve heard your feedback, and we’re excited to announce what we’ve created in response. Faithlife Connect, a single subscription that draws together hundreds of videos, ebooks, courses, Bible study tools, and other resources to grow your faith. We’ve built these tools with your feedback in mind and are confident you will love what you see. But we also want to hear how we can serve you better. Please follow the group at Faithlife.com and share with us today, then keep reading to learn about other ways we are working to come alongside you in ministry. We know churches desire to be good financial stewards. And because online giving is the future of tithing, we’ve introduced Faithlife Giving, an electronic platform for givers to gift funds to churches and nonprofit ministries. Churches will benefit from simple, streamlined budgeting with electronic records, saving time and effort. Donors can give through their desktop or mobile device with a single or recurring donation and easily add funds to different events—or split funds between events. And because it’s integrated with Faithlife Groups, givers can get more involved in mission while supporting their church. How can we help your church give more cheerfully? Let us know in the Faithlife Giving community. Another new product, Faithlife Sites, helps churches easily build and maintain websites. This integrated website platform automatically updates a church’s website based on information such as the church calendar, smart photo galleries, and most recent sermon. It’s built for community and so easy you barely have to touch it. Join the Faithlife Sites group, and learn from others who are using Faithlife Sites. More churches and individuals are leveraging Faithlife Groups to communicate activities and build relationships across their church community. A Faithlife Group supplements individual and community experiences with faith-based books, films, and images to help you go deeper in Bible study. Unique to Faithlife Groups are prayer requests, events, and newsletters. And the Faithlife Groups app allows you to connect with your community on the go! Groups can be public or private, and items can be shared within those groups to foster a community that’s always connected. Are you already using Faithlife Groups in a creative way? Post your story here. Or create a free group for your church or Bible study group today on Faithlife.com. On the horizon . . .
We know how hard you work but also how much time administrative activities take. That’s why we are working on creating a new suite of products that will strengthen relationships across your staff and whole congregation to help you fulfill your mission—and give you back time to do what you do best: ministry. Stay tuned for when this product goes public. Logos 7 Fundamentals is a brand-new Logos package that helps anybody deepen their Bible study, no matter their skill level. It offers the breadth of what a good Bible study library should have, including dictionaries and encyclopedias, commentaries, word study resources, theology resources, devotionals, and more. Purposefully lean, Logos 7 Fundamentals is perfect for anybody who wants to deepen their Bible study on a budget. Where can you find solid biblical content that will deepen your Christian walk without overwhelming you? Meet Faithlife Connect, a single subscription to hundreds of Christian resources—videos, Bible study tools, courses, Logos, ebooks, and Bible Study Magazine—as well as exclusive discounts. Check out everything included in Faithlife Connect, and be sure to let us know what you think by posting in the Connect group. It’s here! 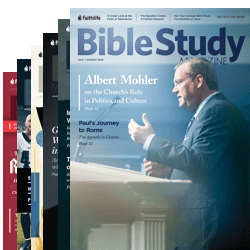 Bible Study Magazine is now available digitally in a new Logos format. You’ll enjoy the same sound advice, tools, and methods for Bible study from pastors, professors, historians, and archaeologists as in the print version. What articles have you recently enjoyed in Bible Study Magazine? Follow the group and share them in a post. The Faithlife Ministry Relations team will be at a number of conferences in the summer months including the Young Leaders Conference in Atlanta, GA on August 2–4. Stop by our booth. We’d love to see you! We’re always looking for talented, awesome, fun employees. Interested? Join our team! Our goal is to build products that help you grow in the light of the Bible and give you back time to do what you do best: ministry. We’re hearing you like what you see—but we want to know how we can serve you better. Follow Faithlife.com today and let us know what kinds of products and tools will help you grow in the light of the Bible.